The long-running Contra series doesn't look like its finishing any time soon. Contra: Evolution, a remake of the NES classic, recently launched on Apple's app store in North America - only to be removed mysteriously. Turns out it wasn't ready and it'll be available at some point later in the year, however, it seems Konami already has its sights set on the next game as it has registered a trademark for Contra Run & Gun. Contra hasn't shown up on a Nintendo system since the insanely difficult Contra ReBirth on WiiWare and before that of course we had Contra 4 on the DS, which was developed by WayForward. Konami's David Cox, who works very closely with MercurySteam, said earlier in the year he would love to work on a new Contra title. Has he got his wish? Would you like to see another Contra title come to a Nintendo console? Let us know your thoughts in the comment section below. If it's 2D, I'm game. I hope we get a new Gradius game as well. contra rebirth was cool, I would love to see a new instalment. @hydeks It also has the original contra as well as super c included. @Bulby This is Konami so you're probably right. @hydeks: Wow, you've been missing out. Contra 4 is very tough though, good luck beating it and unlocking everything! I'm game for a new contra. Let's hope it still to its 2D old school roots though. I want 3DS Contra so bad it's not even funny. I'd even settle for a Wii U Contra though. The emulation for Contra and Super C on Contra 4 was pretty darn bad though. I am very happy Super C came out on the VC for the emulation issues I've had on Contra 4 disappeared. Now all I need is VC Contra. I really hope this new Contra game will be on 3DS or on the Vita. Oh please not Mercury Steam let Wayforward do it. New contra? Wii U? I'm in already. I want to see the game in it's Probotector shape. Those robots are way cooler than the Contra characters. @xsatanachistx Contra 4 has Probotector as an unlockable character. 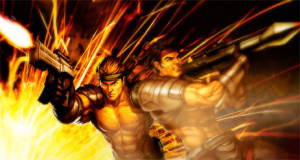 Contra Run & Gun confirmed for Xbone launch, Kinect only. If its not something like this, I'm not interested. But maybe Konami will make good on their promise of Contra 3D and release a sprite-based 2D Contra for 3DS. That would be awesome. But it still sounds like an iOS endless runner. My favourite Contra is Hard Corps on the Mega Drive/Genesis - ingeniously well thought out bosses and multiple paths to choose through the game. Hoping anything new will follow that blueprint. Sounds like a Temple Run game coming to mobile devices. I wouldn't mind seeing a new Contra game. Hopefully it will be a good one. Konami once made an arcade basketball game called Run and Gun (that had to rename for obvious reason when they wanted to make an NBA-licensed console port). Let's hope they don't consider combining the two. With the way Konami has been lately, i wouldn't be suprised if they turned Contra into a westernized 3D Gears of war rip off. They royally screwed over Castlevania and Silent Hill. Contra's next! Even ReBirth didn't meet the Contra Standards. It was too short, uncreative and the majority of bosses were just lazy, save for the space centipede. Contra, and Contra 4(even though it felt like a remake, calling it contra 4 just isn't right) are top dog imo. Hardcorps was balls to the walls contra crack which was pretty darn fun, if you can get past it's nastier color pallette, grating muffled SFX & staticy/scratchy techno-rock soundtrack, the 16-bit post appocalyptic Contra III: The Alien Wars I always found was a bit overrated and Super C is a dissapointing sequal to the first, but on it's own it's actually a pretty decent ride. Yet Operation C which borrows heavily from Super C while adding some some great new stuff(like the final mech boss battle) is even better! Still haven't dipped into Shattered Soldier or Uprising yet...As is, contra, Conatra 4, and Operation C are my favorite of the Bill Rizer bunch! @Chuckie-Doll Have you play Contra Shattered Soldier on the PlayStation 2? It's like the direct followup to Hard Corps / Probotector Mega Drive. I second that it sounds like an iOs game to me too. Has anyone played the Contra game that's called something else entirely? It's called "Hard Corps: Uprising" and it's on the PSN. It's the prequel to Contra: Hard Corps and to me its what classic Contra would be on the PS3. @Magrane I've played it. Not really a Contra game and not up to Contra quality, a disappointment. You must be confused with Contra Force. @WaveBoy: I loved Contra Force. Too bad it's so rare and expensive on ebay. Was the title ”move and shoot” not available? @Mahe: No I have not! That is a selling point there - typical I sold my old PS2 a few months back...maybe the PS4 will be PS2 backwards compatible and I'll ebay a copy. Thanks for the recommendation. Contra 4 for the DS was a GREAT but BRUTALLY difficult game. It had a lot of content to unlock, including the NES versions of Contra and Super C. I still play it from time to time on my 3DS. If any of you out hasn't played, give it a try....especially if you're a fan of the series. Come to think of it, maybe Konami will FINALLY release the NES Contra for the Wii U VC since it hasn't made an appearance yet. @Chuckie-Doll If you live in North America, Contra Shattered Soldier is coming to PSN as a downloadable on PS3. If you live in PAL land, you might have to wait a while. Contra : Evolution on mobile will be what the trademark is for.